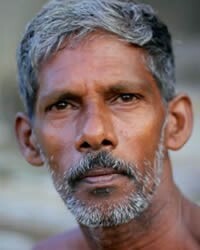 The Dhobi are a large collective community of India, Pakistan, Bangladesh and Nepal. They derive their name from the Sanskrit term dahv which means 'wash'. The Dhobi are traditionally the clothes washers. They are a schedule caste in many of the states of India, where the majority of the Dhobi live. A majority of the nearly several million Muslim Dhobi live in Pakistan. Today more than most South Asian communities the Dhobi have maintained their traditional occupation of washing clothes and running laundry services. 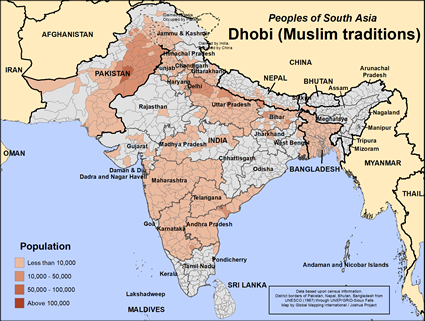 In north India and Nepal some Muslim Dhobi are involved in government service jobs and agricultural labour. In Nepal most of the Dhobi are considered a depressed caste, but 'touchable'. The Muslim Dhobi of Nepal mainly speak Nepali and Urdu are more numerous in Saptari district. Though some small success has come in ministry to the Hindu Dhobi, the Muslim Dhobi have no known work among them in Nepal. In general, the attitude of the Dhobi to education is quite good and literacy in some locations is higher than other Muslim communities. May the Lord use education as a means to bringing many Muslim Dhobi to faith. View Dhobi (Muslim traditions) in all countries.